Fish is an ingredient used in Provisioning to make a variety of Food dishes. As a meat-type ingredient, all standard recipes using fish will have an Increase Maximum Health effect. 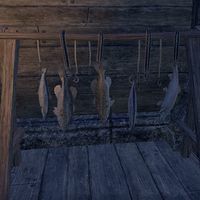 Fish may be found in containers throughout Tamriel, and may also be found on tables and hanging from hooks or strings in cooking areas or camps. Note that fish caught via Fishing, excluding collectible specimens, can be used in Provisioning recipes once it is made into fillet. Gourmet Dishes involve Meat, Fruit, and Vegetables, and increase all three attribute maximums. This page was last modified on 3 April 2019, at 01:15.